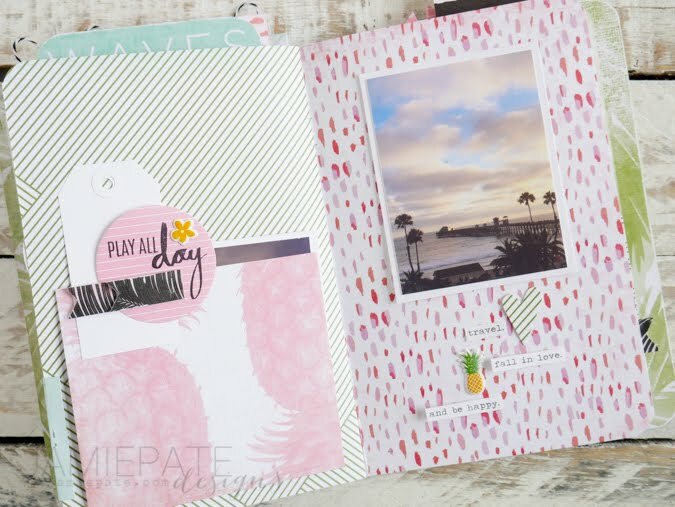 Welcome to this bonus material post for the Pineapple Crush Interactive Mini Album from Bella Blvd Designer Day 2018. After this mini album is created there is lot of cut-off pattern paper to add even more embellishment. 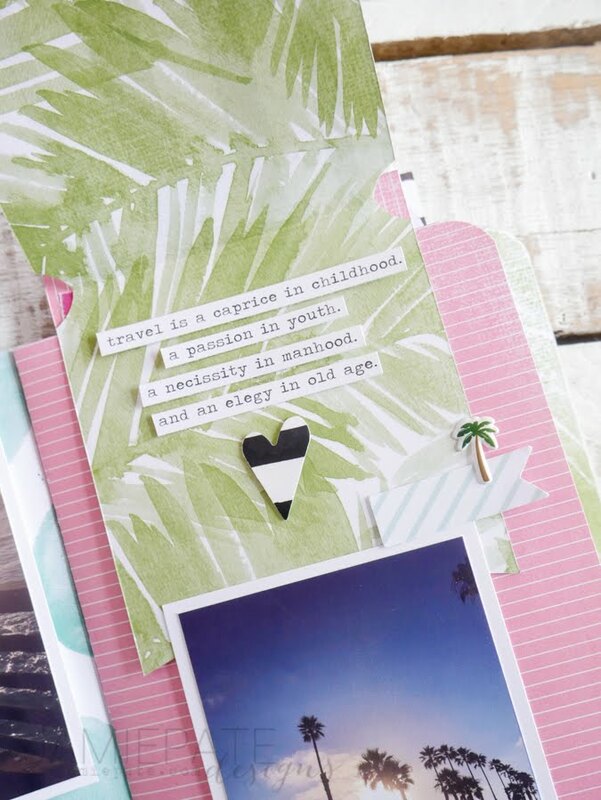 This post is to show how that paper was used to create a lot of fun embellishment is this album. 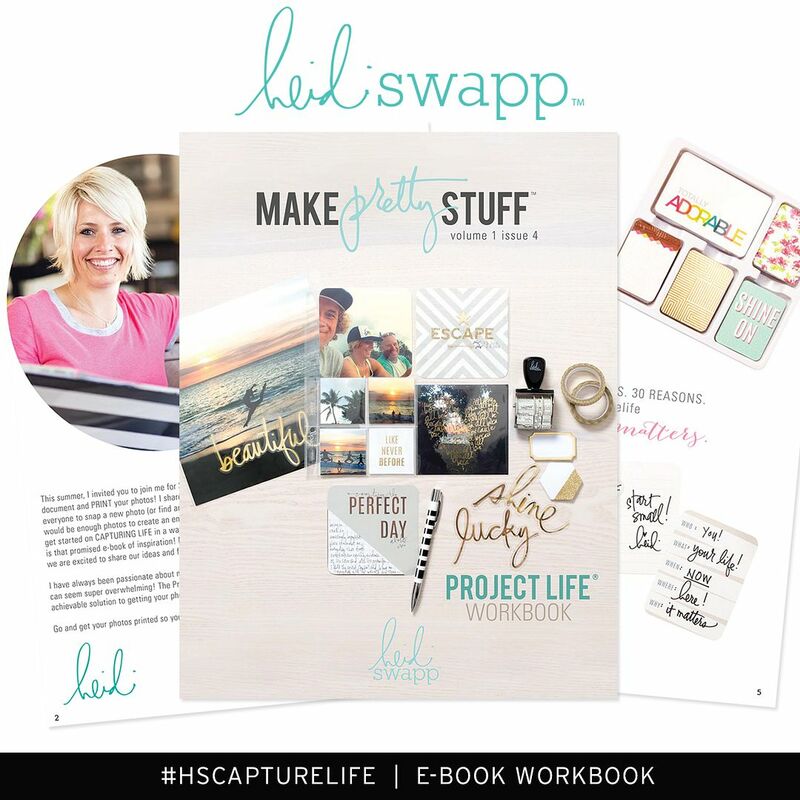 The class and kit's focus is on the creating of this type of mini album that can be used over and over for many different themes. 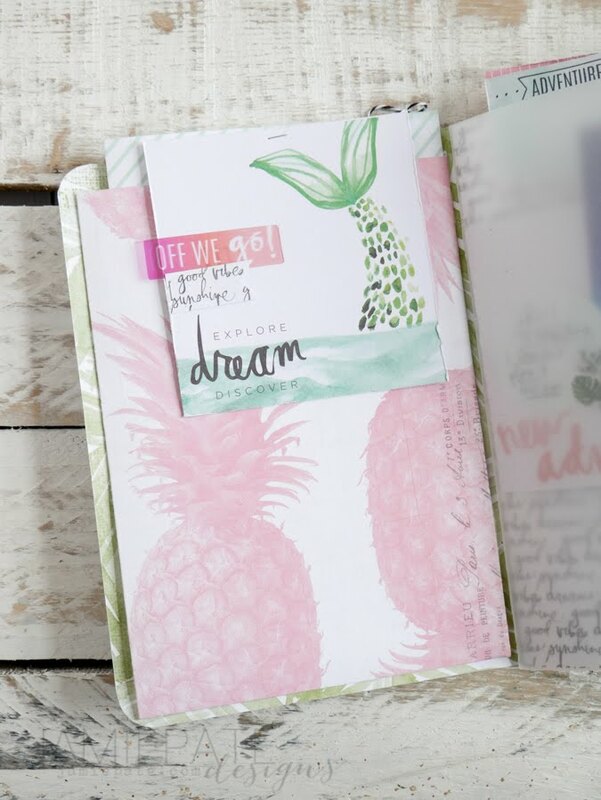 Fearing we would not have time to get to the embellishing, plus the Ephemera being different from kit to kit, I wanted to provide extra ideas for you and this Pineapple Crush Mini albums. Any of the Ephemera pieces can be substituted for any other type of embellishment. These are only suggestions to inspire your own creativity. The image above is a second option to the front of the album with a different pattern paper tag as well as a different Foam Word. This is the inside cover pocket. 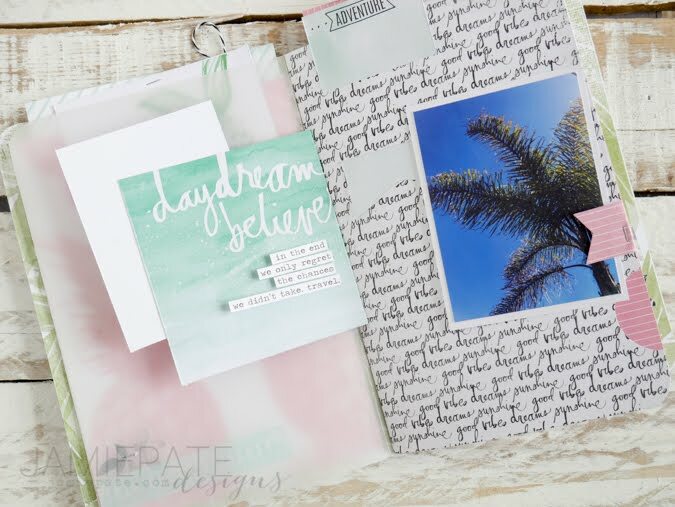 Clear Ephemera was added to the 'Dream' tag as well as a notched pattern paper tag. 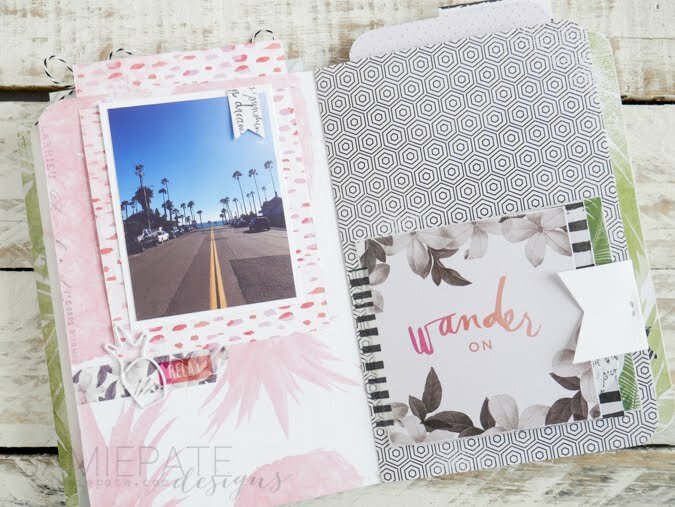 You will see lots of notched pattern paper tags in this album as that is a go-to technique for me when adding extra color and dimension to my scrapbook pages. On the facing page I added a circle that was paper punched from pattern paper and used as a journaling spot. A Puffy Sticker plus a clear Ephemera heart was added to that cluster as well. A v-notched 3/4-inch wide pattern paper tag was wrapped around the right side of the page and mini attached in place. Type journaling or quotes via a type writer or computer. 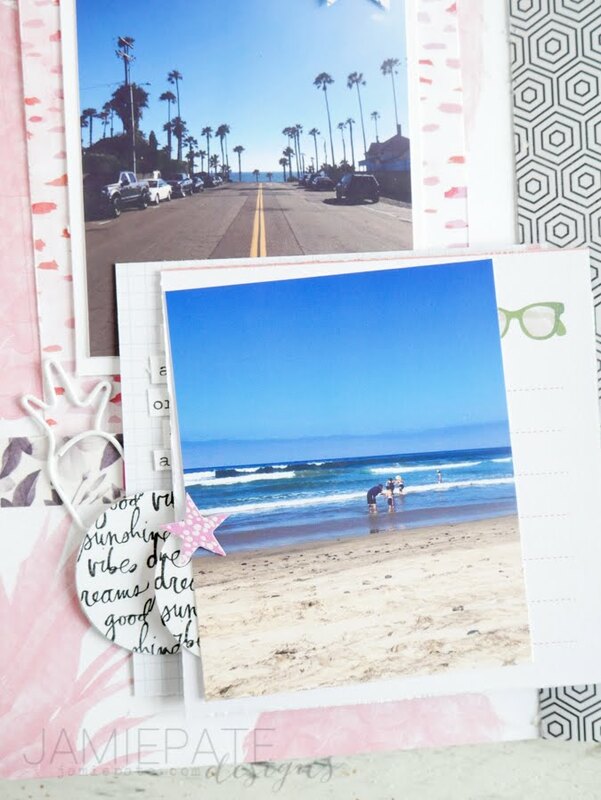 Trim them to strips and add to the inside of the Mini Messages 4x4-inch interactive page. 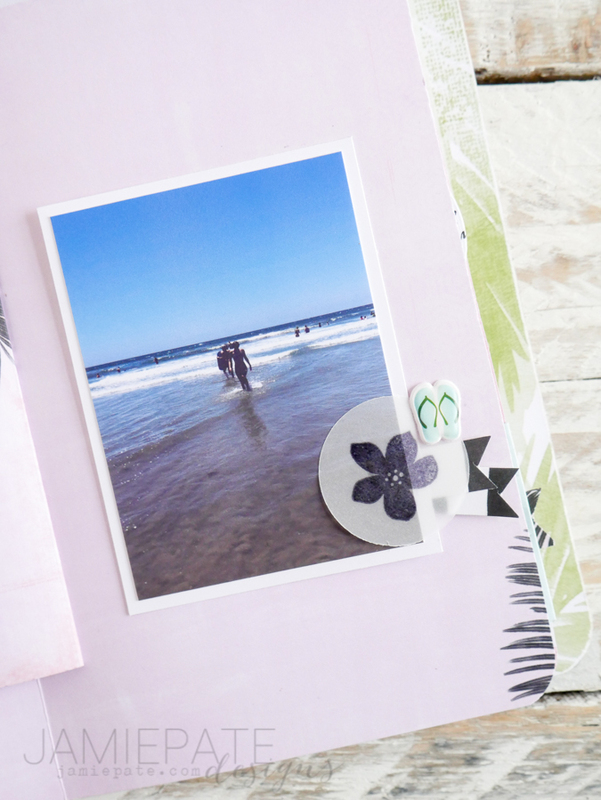 On the next page, left side, add a piece of Washi tape to a photo. Punch pattern paper with a circle punch, punch a sentiment, and layer under photo. Create a tag from pattern paper and punch a hole in the top and tie another tag from the Ephemera and attach to page. Add pattern paper punched with a heart punch and attach to tag with mini attacher. Add a Puffy Sticker to the heart and tag. 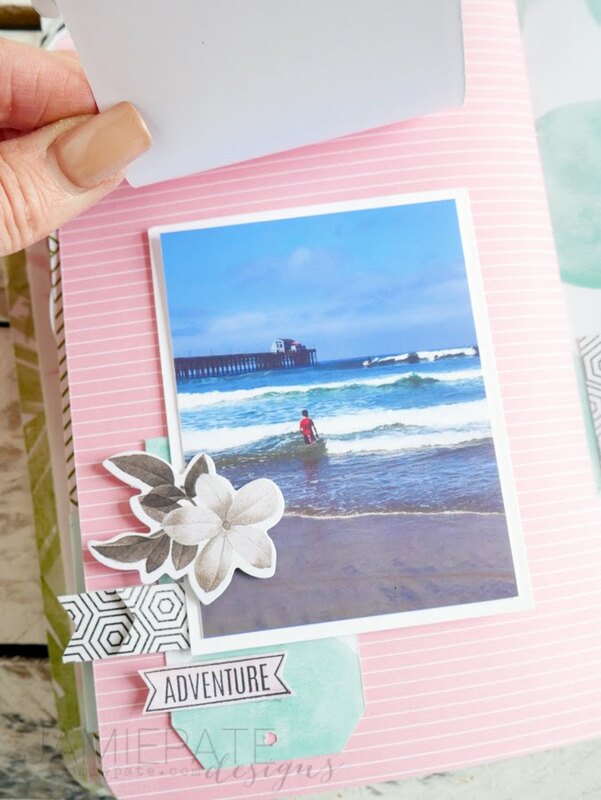 On facing page, create a mini tag and attach to the black and white strip flap. 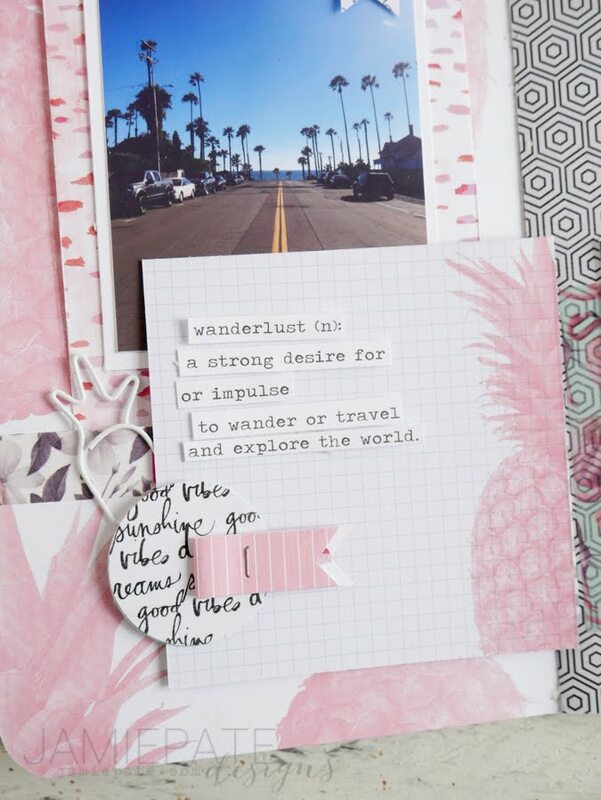 Stamp sentiment on cardstock, trim in strips and adhere to mini tag. Layer with a Puffy Sticker. Open the flap. Add journal strips if desired. Punch a heart shape from pattern paper and adhere under journal strips. Make a small v-notched tag from pattern paper. Layer over paper. Add a Puffy Sticker to the notched tag. Create or make a tag and tie with baker's twine. Add a die cut word or word from Ephemera. Add also a Puffy Sticker. 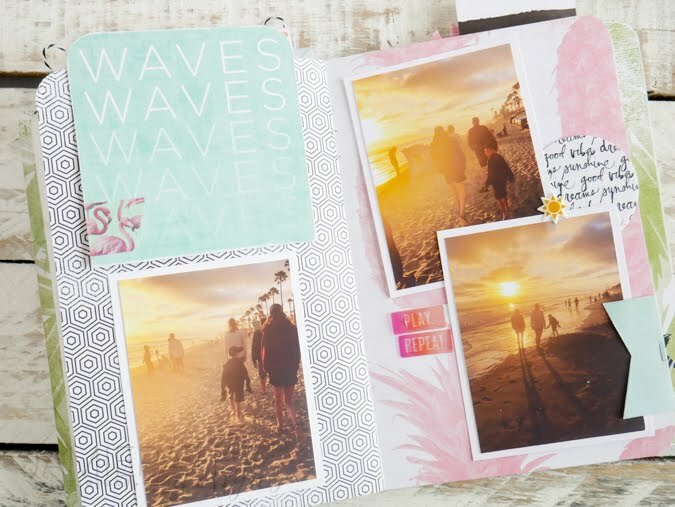 Journal strips layered over photo are also a nice addition. Layer v-notched pattern paper under the flap. Add little v-notched pattern paper to upper right side of photo. 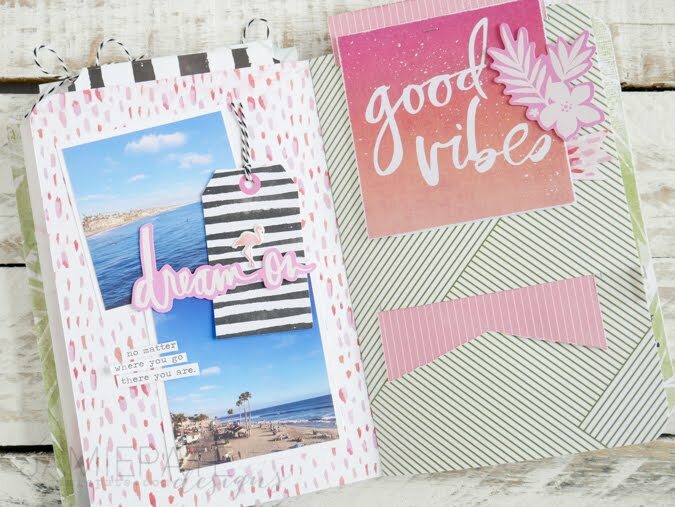 Add Washi tape to page. Layer with a clear piece of Ephemera. Clip a Pineapple Clip in the slot on page. Open first mini page flap and add a circle punched piece of pattern paper. 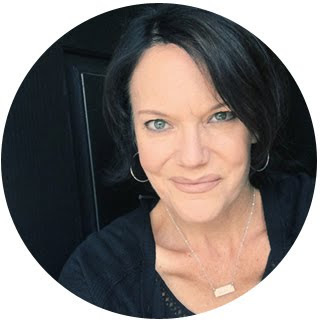 Create a long v-notched tag, fold without creasing, and staple to circle. 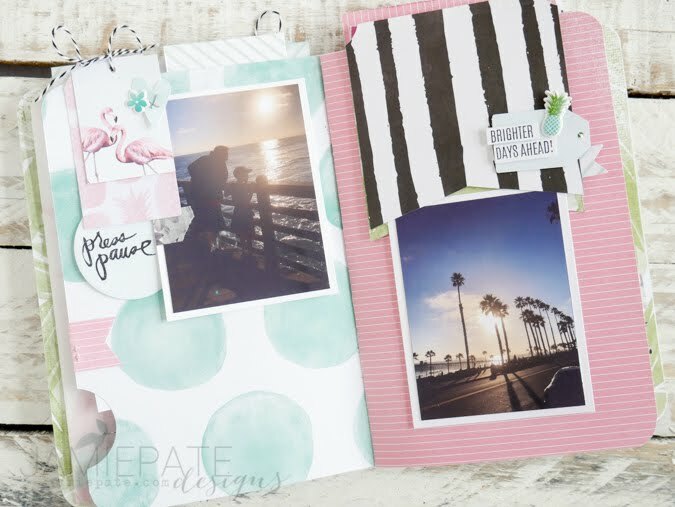 Add journaling strips if desired. layer with additional pattern paper punched pieces. Layer with a piece of Ephemera. 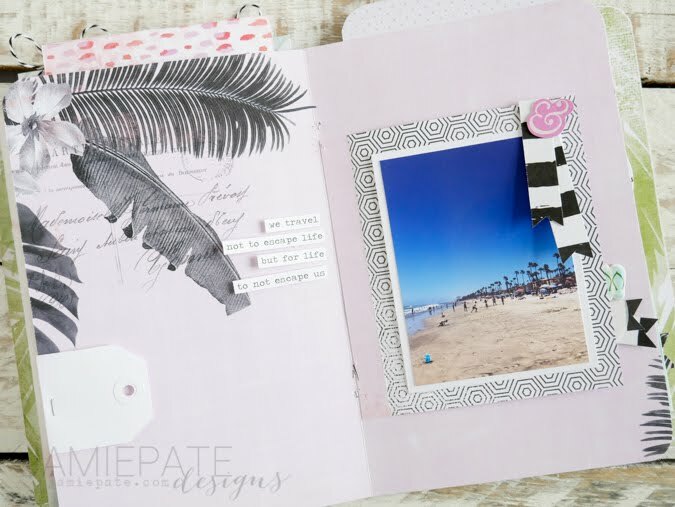 Add journal strips to left side page. Create two v-notched tags. Attach to upper right side of photo layered with a piece of Ephemera. Stamp a circle punched piece of vellum. Layer over photo. Add v-notched tags under photo. Add photo to lower half. Add a swatch of Washi tape to flap. Circle punch pattern paper. Layer under photos with most of pattern sticking out. Layer that with a Puffy Sticker. Cut a piece of pattern paper from a 2-inch wide strip. Notch one end. Wrap around page edge and attach with tiny attacher. 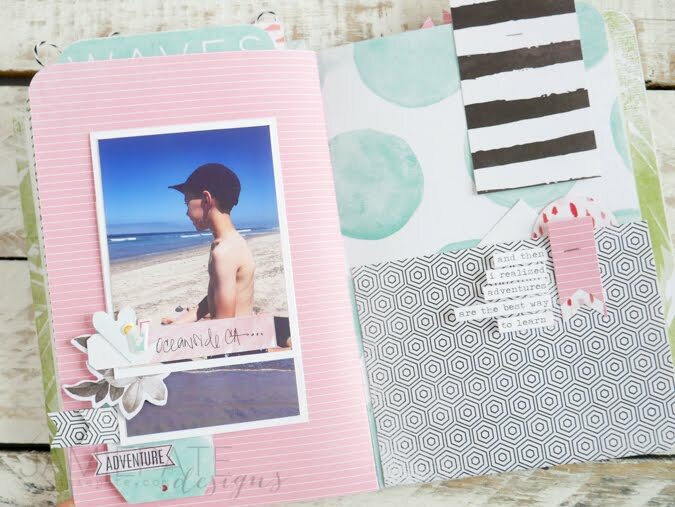 Layer page with additional Ephemera pieces. To left side flap, adhere white tag. Circle punch pattern paper. Stamp with sentiment. Layer v-notched tag to circle. Add a Puffy Sticker to the circle tag. 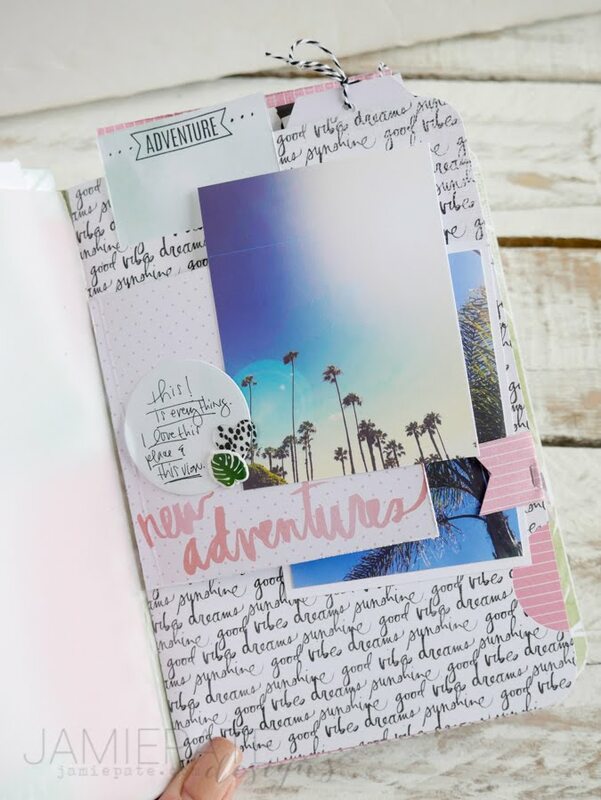 Add journal strips interspersed with paper punch pattern paper as well as Puffy Stickers. Layer tags and punched pattern paper and Puffy Sticker and Ephemera on top photo. Add additional photo under first photo. Create a tag and layer under all the photos. Stamp sentiment on pattern paper. Trim out and add to larger tag. Add Ephemera as well as notched tags. Last page is already in page with the left side pocket as part of the original book. 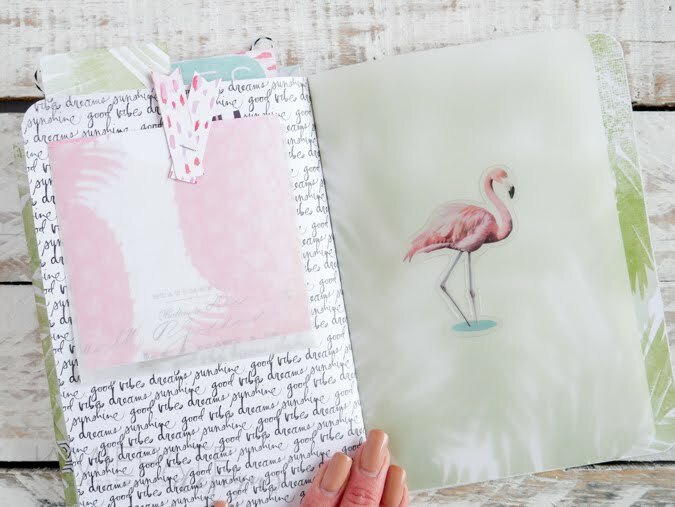 Add a sticker or Ephemera piece to the vellum side.